There is an "irreconcilable difference" between two former DUP special advisers and their accounts of which of them sought to delay RHI cost controls. The remark came during Timothy Cairns' second day at the RHI inquiry. Mr Cairns has claimed he was told by another DUP special adviser (Spad), Andrew Crawford, to seek the latest possible date for cost controls. Mr Crawford has said the decision to seek the latest possible date for their introduction was Mr Cairns' alone. Mr Cairns was adviser to Jonathan Bell when he was enterprise minister from May 2015 until May 2016. By summer 2015, officials had realised the extent of the scheme's overspend and were working to bring it under control but cost controls were not implemented until November 2015. The delay allowed hundreds of extra boilers into the lucrative scheme and added a huge potential burden to the public purse until the subsidy payments were heavily cut. Mr Cairns has already given evidence claiming he was told by the DUP's top official, Timothy Johnston, that cost controls would not be brought in and to work with Dr Crawford, who was working with Arlene Foster in the Finance Department then, to look at an alternative. Mr Johnston has denied any involvement. On Wednesday, it emerged that Mr Crawford has given another witness statement to the inquiry claiming he only provided advice to Mr Cairns. He said at no time had he discussed or agreed a party position on cost controls with Mr Johnston, and that he never "indicated to Timothy Cairns that he should seek as late a date as possible for the introduction of cost controls". In response, Mr Cairns said: "That's where our memories are different." Inquiry chair Sir Patrick Coghlin said: "One of you is being accurate or telling the truth about that, but not both." He would have to assess the "credibility" of both men, he added. That led junior counsel to the inquiry, Donal Lunny to state that there was an "apparently irreconcilable difference" between the accounts from Mr Cairns and Mr Crawford. It has emerged that the pair had a difficult working relationship throughout their time together at Stormont. Also on Wednesday, the inquiry heard Mr Cairns had several phone conversations with Mr Crawford about the RHI scheme during summer 2015, but there are no official records of what those conversations included. Sir Patrick asked if that would have happened often when "sensitive matters" were being discussed. Mr Cairns said it was "just a reflection of the informality", but admitted that it was an "appalling way of doing things". The inquiry was also told that the potential electoral price for introducing cost controls to the RHI scheme was one of the considerations in seeking a delay. The inquiry heard claims that Mr Cairns and Mr Crawford were working up a strategy to delay them for as long as possible. And this at a time when communication between the two men showed that Mr Crawford was aware of potential abuse of the scheme. Mr Cairns told the inquiry only he and Mr Crawford were working on the plan but that it was referred back to Timothy Johnston. Mr Johnston has denied that he was involved in the strategy, or had directed the two others to draw it up. Mr Cairns said the party was sensitive after earlier criticism it had received over the withdrawal of subsidies for wind turbines. They had been lobbied to ensure that the same thing didn't happen with RHI. He said electoral fallout was one of the considerations. "There's obviously a political dimension to this which is obviously the world which we work in, and the political dimension is that whatever policy you're going to the public with, you have got to be able to hand on heart say we did our best with this policy or electorally that's going to be a problem." Mr Crawford is due to give evidence to the inquiry again on Thursday and Friday. In his latest witness statement, which is due to be published on Wednesday, he said it was Mr Cairns who was concerned about further negative publicity following the closure of that wind energy scheme. He also claims Mr Cairns was worried that given his difficult relationship with Jonathan Bell, he could lose his position as special adviser. Mr Cairns told the inquiry: "That certainly wasn't in my mind; if Andrew Crawford wanted the job, he could have had it." 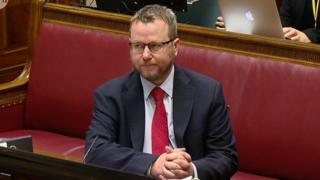 Later, Mr Cairns repeated his claim that Arlene Foster was told the party's most senior adviser, Timothy Johnston, was involved in delaying RHI cost controls, a day before she gave an interview to the BBC where she said he had not been involved. Timothy Cairns said the DUP leader was made aware during a conference call in December 2016. A day later, she told the BBC's Stephen Nolan that Mr Johnston had no role in delaying subsidy cuts. Mr Johnston was then Mrs Foster's top adviser. He is now the DUP's chief executive. Mr Cairns said he had called another DUP special adviser Richard Bullick on 14 December 2016. He said Mr Bullick put him on speakerphone and that Arlene Foster and Timothy Johnston said they were in the room. He said another Spad's name, Andrew Crawford, was raised, and then Mr Cairns claimed he said: "But sure Timothy, you directed that process." Mr Cairns told the inquiry when Mr Johnston's name was mentioned, that he "shut the conversation down, said we've other things to deal with - and that was the phone call ended". Mr Bullick later told Mr Cairns that the incident had proven "awkward". "Richard Bullick said that was a little awkward, that part of the conversation, because that's the first time that Timothy and his name had been raised," Mr Cairns said. "He had been adamant that he had had absolutely nothing to do with the scheme, and anything to do with anything myself and Andrew Crawford were involved in." Mr Cairns added that he had a "reluctance" to say anything about Mr Johnston's role after that. Mr Cairns also gave the inquiry his version of events at a key meeting that led to a disastrous delay in cost controls being implemented to the RHI scheme. The decision to push back introducing subsidy cuts from 1 October until the start of November was taken at a meeting on 24 August 2015. The extra four weeks allowed a further 800 boilers to be accredited to the scheme. This added a huge sum to the overall cost. Another inquiry witness, head of energy division at the enterprise department, John Mills, previously said the meeting was led by Mr Cairns and that he did most of the talking, despite the then-enterprise minister Jonathan Bell being present. He also claimed Mr Cairns had been the person who suggested the further delay. Mr Cairns said it was not him, but Mr Mills, who put forward the November date for cost controls to start. He said he asked a lot of questions at the meeting, but said they were only for the purpose of "clarity" so that Mr Bell would have the "fullest briefing" about the department's plans. At the end of Wednesday's hearing, Mr Cairns was asked about a meeting in February 2016, at which he was present with Arlene Foster and Mr Bell. It was during that period of time that plans were under way to suspend the RHI scheme entirely. At the meeting, Mrs Foster asked for the scheme to remain open for a further two weeks, until 29 February. Mr Cairns claimed that request initially came from Sinn Féin, who agreed to back the closure at a time when no other party in the assembly would. "Sinn Féin said we'll come with you, but you have to extend it (the closure date) to the 29th, our support comes at a price," he said.